The Ducru Beaucaillou from our cellar was taken BYOB to Henri Restaurant in Chicago and drank this with L over elegant dinner. It was a great compliment to the Foie Gras and the Game Special Entree - venison with beets, chanterelles, reduction and potatoes purée. The Dover Sole Meunière was delicious with Flowers Sonoma Coast Chardonnay 2008, available and served by the glass. The creme' brulee desert was also good. Henri had a pleasant cosmopolitan atmosphere, great food and attentive service from a professional and knowledgeable server, Megan and the supporting staff. The Château Ducru-Beaucaillou Grand Cru Classe exhibited garrnet color - medium-light delicate body with pronounced floral perfume, black cherry and berry fruits with layers of tobacco, anise and black tea and a hint of leather, with floral continuing on a modest tannin finish. 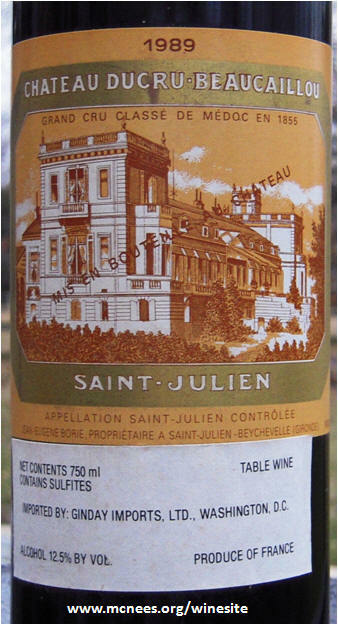 There is still life left in this twenty-two year old St Julien Bordeaux. Blend of 65% Cabernet Sauvignon / 25% Merlot / 5% Cabernet Franc / 5% Petit Verdot.